Today we’re going to look at a very brief history of conceptual art and it’s relationship to “new media” or the sorts of technologies we engage with today in digital media and screen-based media. As we don’t have a lot of time, we can only touch on these histories and look at a few of the artists that have been influential and are accepted as major proponents of contemporary art. This is meant to be a starting place for you to hopefully delve further into the artists mentioned here today to find out more about them. The relevance of “movements” such as conceptual art and Fluxus to screen media and how we use digital media technologies today is important to be aware of. There is a focus on concepts and ideas in this kind of work, not a focus on formats or traditional media – for example, rather than thinking of art as commodified types like “painting” or “photography” or “video”. There is also a more open use of media and technologies of all kinds, and even use of objects or elements not considered “high art”. These movements can inform us about how we use our media now - social media & games culture for example, audience participation & interaction with art and media many aspects of popular contemporary culture, as we will see. I’d like to begin with the artist Marcel Duchamp. He was linked to movements such as Cubism, Surrealism and Dada, but he really can’t be located in one genre or art movement. His work is interesting in many ways, but the reason I want to begin with Duchamp is because he was one of the first prominent artists to work in a “conceptual” way, and use non-traditional, unexpected media or media formats we don’t associate with traditional arts. His “readymades” and “stoppages” used found objects and ordinary everyday materials such as bicycle wheels or string to create artworks. Duchamp’s work was primarily about engaging with ideas and the imagination, and he used humour and a sense of fun and playfulness in his work that was a major influence to a lot of artists that came after him & this leads into areas of conceptual art and in particular Fluxus. 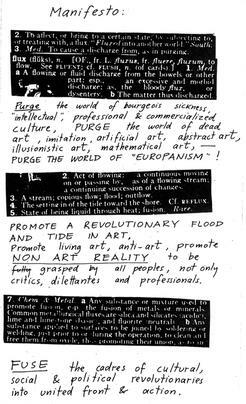 Fluxus isn’t really an art movement or genre that you can define as easily as “Impressionism” for example. There are many artists that don’t call themselves Fluxus artists, but make works that fall into that category. What we understand as Fluxus began in the 1950s but there are artists now that work with some of the ideas that began over 60 years ago. One of the main reasons for studying Fluxus and looking at all these works here today is that many of these artists naturally gravitated towards technologies such as video and digital media. Also, as many of the Fluxus works were “evental” – performance or installation based works that existed only at certain times and places. Media such as photography, film and video were important documentary tools that have helped to preserve traces of these artworks. “Happenings”, events and performances from the 1960s and 1970s can directly be seen to inform certain current practices using the internet and digital technologies – consider “flashmobbing” for example, and many group participatory “events” that take place on social media such as facebook & twitter. The sense of experimentation and play that is a key element in Fluxus works is perhaps one of the reasons that it has endured as a “movement”. The elements of humour and playfulness in Fluxus and the “everyone is an artist” attitude, combined with the immediacy of our current ubiquitous Internet technologies, allows for all kinds of engaging artworks to be created. Cory Arcangel - Arnold Schoenberg, op. 11 - a lolcat concerto?